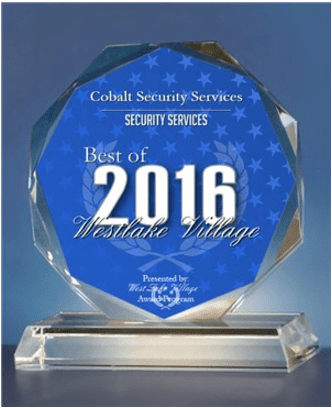 WESTLAKE VILLAGE June 22, 2016 — Westlake Village Award Program has selected Cobalt Security for the Best of Westlake Village Award, in the Security Services category. Cobalt Security has consistently provided the best security services available since the beginning. As stated on the award, recipients “are local companies that enhance the positive image of small business through service to their customers and our community.” Grounded on the core value of providing top-notch professional service, Mr. Esseff is happy to know his employees’ professionalism has not gone unnoticed. Cobalt Security’s professionalism and best security services have gained attention from the community using Cobalt for their security needs. “I believe we have the best individuals working for Cobalt. They proudly represent Cobalt Security and the clients they are respectively linked to” noted Mr. Esseff. Established in February of 2015, Cobalt has taken the security industry by storm by providing the best security services available. The Co-founder and CEO Andrew Esseff, was a former Explosive Ordnance Disposal (EOD) Technician and Officer in the Army. Mr. Esseff and his business partners started Cobalt Security “to set a new standard in the security industry.” Mr. Esseff sought to develop a security company that could provide the best security services with honest, well trained and professional security guards to clients; something he believed the industry was lacking.